Chekhov is undeniably one of the greatest playwrights ever, even if he only produced a handful of full-length plays in his short lifetime (he died at age 44). Of those plays, Uncle Vanya has always been my least favorite. Even his best plays -- The Seagull and The Three Sisters -- aren't exactly action-packed in the way that contemporary dramaturgs and writing instructors champion. But Vanya is unremittingly, aggressively slow and uneventful. If, as some have opined, Chekhov occupies the midpoint between Shakespeare and Beckett, Act IV of Uncle Vanya represents the Beckett end of the scale – time actually seems to slow down to a crawl, the actions evanescent, the pauses longer, the farewells excruciatingly attenuated. Having seen two perfectly good productions (Andrei Serban's at La Mama in 1983 featuring Joseph Chaikin, F. Murray Abraham, Diane Venora, and Frances Conroy, and Louis Malle's film of the Wallace Shawn-Andre Gregory version, Vanya on 42nd Street), I felt like I'd seen enough and skipped many opportunities to see the play again, including the Australian production starring Cate Blanchett that recently played at the Lincoln Center Festival. I'm not sure what possessed me to make an exception and buy tickets to Soho Rep's acclaimed production. I guess because Andy had never seen any Chekhov play, and we're eagerly anticipating Christopher Durang's new play Vanya and Sonia and Masha and Spike at Lincoln Center Theater this fall (starring Sigourney Weaver! ), so he needed to get some of the good doctor under his belt. Thank God I did. 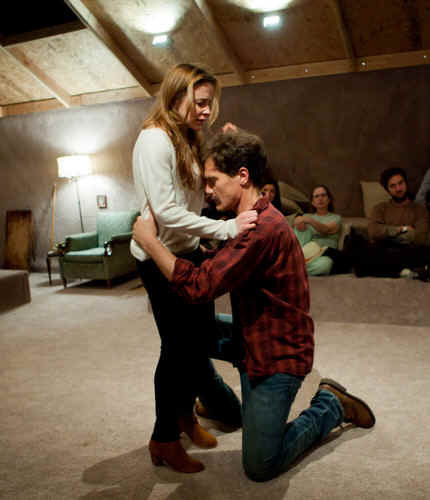 The production is a revelation, as much for the colloquial adaptation by Annie Baker and the staging by Sam Gold (who became famous directing Circle Mirror Transformation and other plays of hers) as for Chekhov's handiwork. Virtually all of his plays spend at least some time depicting a group of people cohabiting a Russian summer house. But I'd never truly apprehended the intimacy and claustrophobia of that experience before witnessing Gold's environmental staging. Set designer Andrew Lieberman turned Soho Rep's tiny black box theater into a custom-made loft so that the audience lounges on carpeted platforms in the same attic-like space where the actors come and go and sing and cry and make out and slug back tea and vodka. Anyone who’s ever spent a week or a month at a vacation rental with family and friends living on top of one another will break into a sweat of recognition watching these people snap between communal nurturing and getting on each other’s nerves with lightning speed. Let's talk about the actors -- Gold assembled what amounts to a band of Off-Broadway superstars who excel both individually and collectively. Reed Birney is one of the least vain actors on the planet. A veteran of Circle Mirror Transformation, he was last seen at Soho Rep in Sarah Kane’s harrowing Blasted, in the course of which he was stripped naked, raped twice (once with a handgun), and trapped under floorboards with water dripping on his head. Here he parks himself in the easy chair at center stage and inhabits the title character as your loudmouth, ever-complaining, defensive, do-nothing fool of an uncle. His niece Sonya is like a daughter and surrogate wife to him, placating him and working alongside him at their accounting business. In this role, Merritt Wever is the quiet center of the production – patient, slow, a plain Jane who’s the soul of kindness. She pines for Astrov, the shaggy handsome misanthropic doctor (a surprisingly subdued yet effective performance by Michael Shannon, the powerhouse star of Boardwalk Empire and Bug) who claims to love no one except for Nanny, aka Marina, the household’s loyal retainer. She is played by Georgia Engel – yes, that Georgia Engel from The Mary Tyler Moore Show, and she’s hilarious, casually sewing and sipping tea with the family until someone asks for something, and then she jumps up and literally runs to do it. The estate belongs to Sonya’s father, a demanding pretentious academic known as The Professor who has the entire household catering to his every whim. We hear a lot about him before we meet him, all of it pretty poisonous. Then he arrives, in the person of Peter Friedman (another terrific actor who was in the original cast of Circle Mirror Transformation), and we get that he’s not as bad as all that, but that his role in the group is scapegoat – he gives everyone else somebody to complain about. His young second wife Yelena has all the men in love with her. Played with impeccable delicacy by Maria Dizzia, she too is an exceptional projection screen – she allows men to see her as glamorous and youthful and pretty, which she is in her long hair and skinny jeans, yet inside she is insecure, entitled, and confused. It’s a pretty toxic combination, yet Dizzia inhabits her deftly, allowing us to see all these qualities without overidentifying with any one of them. She’s got real star quality, like the young Stockard Channing or Mary Beth Hurt. Rounding out the cast are the great Roberta Maxwell, who brings a lot of substance to the small role of Maria, the Professor’s former mother-in-law and #1 fan, and Matthew Maher, a wonderfully idiosyncratic downtown actor who makes an inspired choice to play the disgruntled local landowner Waffles, one of those tricky smaller roles typical to Chekhov that can make or break the ensemble. 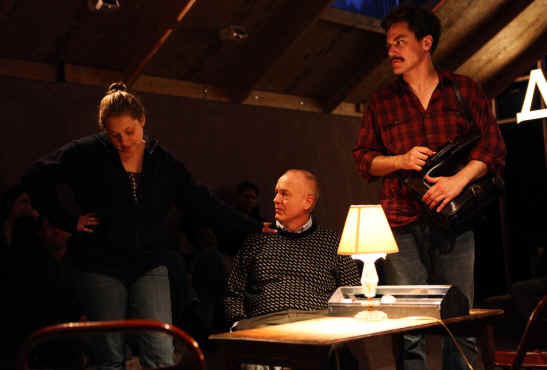 Under Gold’s direction, all these actors (including Paul Thureen, briefly seen as the drunken handyman Yefim) manage that curious thing that makes a production of Chekhov fly – a completely contemporary, unforced acting style that conjures without contradicting the 19th century Russian world of the play. They clearly thrive on Baker’s simple, direct, very playable version, which is scrubbed of archaic language. I liked how Shannon’s Astrov repeatedly refers to people as “creeps,” and the scene where Sonya stands in front of Vanya, who has stolen a vial of the doctor’s morphine, and keeps quietly, insistently saying, “Give it back,” until he does. Gold and his cast mine the script for the tiny gestures through which Chekhov manages to make scenes of nothing happening contain all of life. We wondered what an ancient map of Africa was doing hanging over the piano near where we were sitting – until Astrov, in the course of his endless farewell, utters one of those non sequiturs Chekhov is famous for (“Must be hot in Africa right now”). The line is in the script but people sitting on the other side of the loft might not even have noticed the map. You had to be there.